Coming straight out of Oakland, California, The Coup are a political hip-hop band that are as smart as they are controversial. 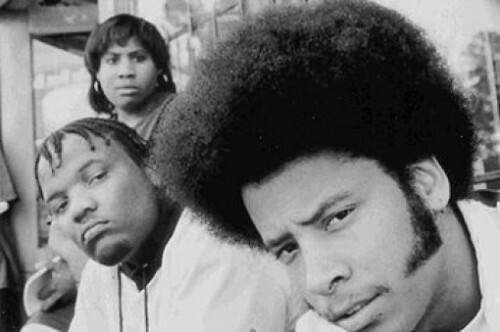 Emcee Boots Riley and DJ Pam the Funkstress hold down this dynamite group, emancipating classical hip-hop roots, while still remaining forging their own sound. With soulful bass-driven beats, and big hooks, The Coup have a diverse catalog. The lyrics are intelligent with a poli-sci lean, while always smooth and focusing a watchful eye on mainstream American culture, media, and capitalism. With vast rivers of flow, The Coup at times remind listeners of class hip-hop pioneers like De La Soul, Tribe Called Quest, Common Market, Public Enemy, and even N.W.A. A new listener should check out The Coup's latest releases. They had two songs in the 2007 silver screen hit, Superbad, songs in the video games including "NBA Live" and "Skate," and have also been featured in the anti-war documentary called "Sir! No Sir!". If you like your hip-hop served up with soulful wit and intelligence, give The Coup a listen. Posted on March 28, 2011 by Justin and filed under Music and tagged NWA Superbad The Coup.